Structural deformities of the femoral head occurring during skeletal development (eg, Legg-Calvé-Perthes disease) are associated with individual shapes of the acetabulum but it is unclear whether differences in acetabular shape are associated with differences in proximal femoral shape. We questioned whether the amount of acetabular coverage influences femoral morphology. We retrospectively compared the proximal femoral anatomy of 50 selected patients (50 hips) with developmental dysplasia of the hip (lateral center-edge angle [LCE] ≤ 25°; acetabular index ≥ 14°) with 45 selected patients (50 hips) with a deep acetabulum (LCE ≥ 39°). Using MRI arthrography we measured head sphericity, epiphyseal shape, epiphyseal extension, and femoral head-neck offset. 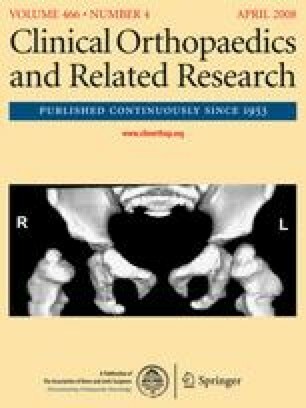 A deep acetabulum was associated with a more spherical head shape, increased epiphyseal height with a pronounced extension of the epiphysis towards the femoral neck, and an increased offset. In contrast, dysplastic hips showed an elliptical femoral head, decreased epiphyseal height with a less pronounced extension of the epiphysis, and decreased head-neck offset. Hips with different acetabular coverage are associated with different proximal femoral anatomy. A nonspherical head in dysplastic hips could lead to joint incongruity after an acetabular reorientation procedure. Level of Evidence: Level IV, retrospective comparative study. See the Guidelines for Authors for a complete description of levels of evidence. One or more of the authors (SDS, MT, KAS) has received funding from the National Center for Competence in Research “Computer Aided and Image Guided Medical Interventions (Co-Me)” of the Swiss National Science Foundation (SNF).